Thailand - Air Force Boeing 737-4Z6 landed at the Airport Bern-Belp in Switzerland. The aircraft carries the Thai registration marks HS-CMV. HS is the national prefix of Thailand. CMV stands for Crown prince Maha Vajiralongkorn. His Royal Highness the Crown Prince of Thailand Maha Vajiralongkorn is an avid pilot and often flies the aircraft by himself. The Boeing 737 is powered by two CFM International CFM56-3C1 turbofan engines that produce maximum 23,500 pounds-force (105 kN) of thrust each. 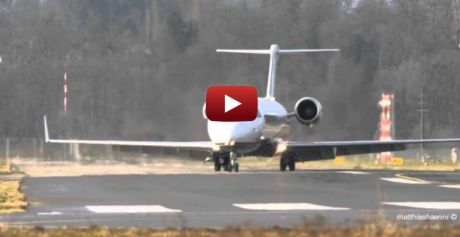 On 30th January 2013, Gulfstream G550 with registration marks 4K-A106 took off at the Airport Bern-Belp in Switzerland. The business jet aircraft is operated by the Government of Azerbaijan for VIP transport. On 4th January 2013, Canadair CL-600-2B19 Regional Jet CRJ-200SE, registered als OD-TAL, landed at the Airport Bern-Belp in Switzerland. The OD prefix denotes an aircraft registered in Lebanon. The jet is operated by Easy Fly based in Beirut, Lebanon. It was a VIP charter flight. The jet is powered by two General Electric CF34-3B1 engines. Pilatus PC-12 HB-FVZ Take Off at Airport Bern-Belp - Nice Turboprop Sounds! On 30th January 2013, Pilatus PC-12 with registration mark HB-FVZ took off at the Airport Bern-Belp in Switzerland. The Swiss made Pilatus PC-12 aircraft is a single-engine turboprop aircraft. The manufacturer Pilatus Aircraft Ltd offers the PC-12 in different versions for transporting passengers and/or cargo. The airplane is powered by a single Pratt & Whitney Canada PT6A-67B turboprop engine. 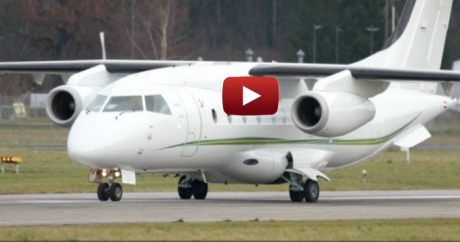 Listen to the nice turboprop sounds! On 30th of January 2013, Azerbaijan Airlines - AZAL - Airbus A319 "GAZAKH" with registration marks 4K-AZ05 took off at the Airport Bern-Belp in Switzerland. It was a charter flight to Baku, the capital of Azerbaijan. This aircraft is powered by two CFM56 turbofan engines. The A319 is a smaller member of the Airbus A320 family. On 5h January 2013, British Aerospace BAe 146-100 with registration mark G-OFOM took off at the Airport Bern-Belp in Switzerland. The aircraft is call signed "Forumla One" that reveals its operator the Formula One Management Ltd.
On 5th January 2013, a Dornier 328JET with registration marks OE-HTJ took off at Airport Bern-Belp in Switzerland. The aircraft is operated by Tyrolean Jet Service. 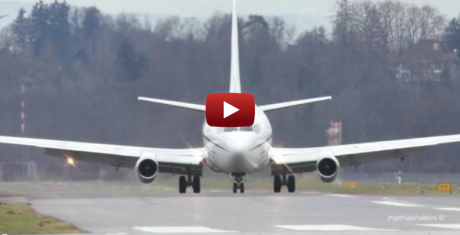 On 3rd January 2013, a Boeing 737-200 / 737-2V6 Advanced takes off at the Airport Bern-Belp in Switzerland. It is a privately owned aircraft with registration marks VP-CAQ. 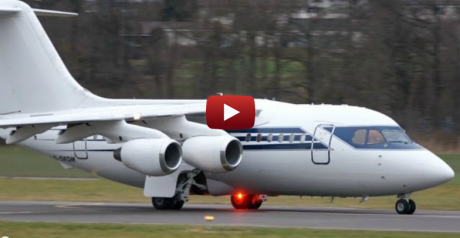 Listen to the distinctive Pratt & Whitney JT8D turbofan engine sounds! The take off trembled the ground! 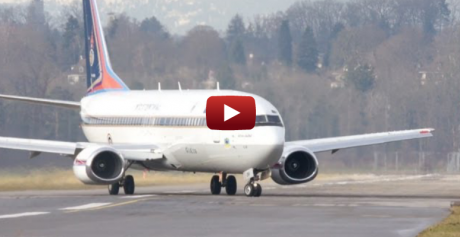 A Boeing 737-200 / 737-2V6 Advanced landed at the Airport Bern-Belp in Switzerland on 3rd January 2013. It is a privately owned aircraft with registration marks VP-CAQ.